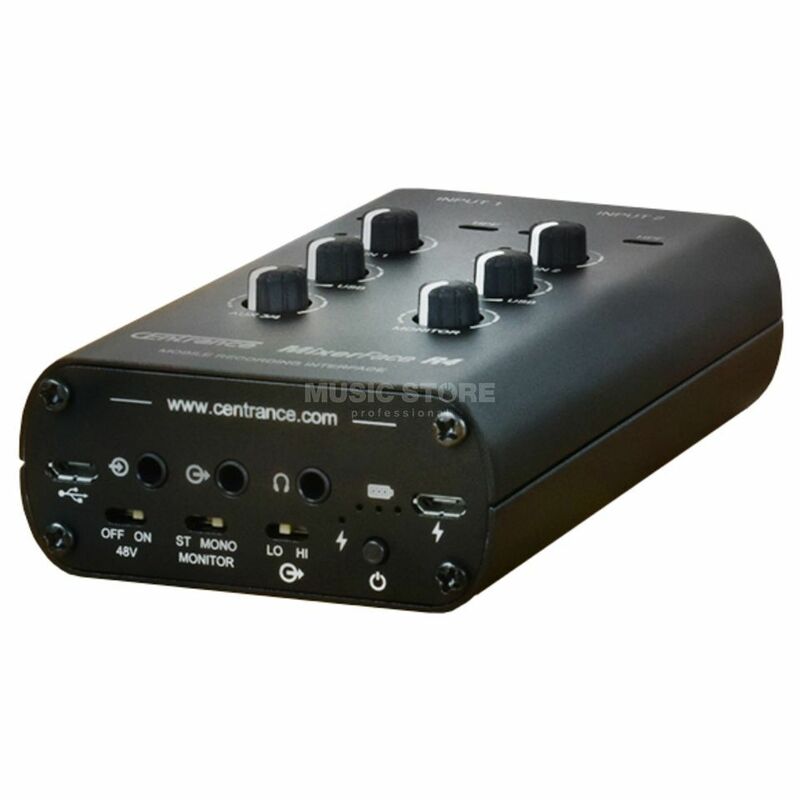 Thanks to the rechargeable lithium polymer battery and the various connectors for smartphones, tablets or microphones, the Centrance MixerFace R4 is a practical, compact and solid recording interface for mobile purposes. Professional recordings can be made on the go and anywhere. Whether you're recording interviews, instruments or at home, the Centrance MixerFace R4 with its high-quality Jasmine microphone preamps delivers crystal-clear results every time. Phantom Power, Zero Latency Mode, Hi-Z Inputs and Low-Cut Filters are also on board, so the user is flexible and prepared for any situation. And for those who want to hear backing tracks parallel to their vocals, for example, external signals can easily be added via Aux. The R4Audiointerface also cuts a fine figure in the studio and can be used as a fixed solution. In general, the R 4 Recorder is compatible with almost all recording apps, so that the user can also work with his favorite programs on the smartphone/tablet. Up to 8 hours operating time are possible before you have to recharge it via a standard USB charger. Impressive run time from its Li-Po battery. Well-suited to many music, video and broadcast applications. Compatible with iOS (iPhone/iPad), Android, Linux, Mac and Windows operating systems. Mini-jack audio adapter cables are an essential purchase. Use with iPad, iPhone and Android requires CCK or OTG cables. A truly mobile, high-performance combination of a four-input analogue mixer and 2x2 USB audio interface, the battery-powered MixerFace R4 offers a high level of analogue and digital performance in a compact form factor that makes it ideal for use by musicians, videographers, broadcasters and podcasters. There’s a lot to like about he MixerFace R4, and little to complain about. Although a 2x2 USB interface at this price might seem somewhat expensive these day its truly mobile operability, mixer level of audio performance, iOS, Linux, Mac and Windows compatibility plus its battery life give it a flexibility of application hat, to my mind, more than justifies the premium that you’ll pay for an R4, and totally overcomes the inconvenience of having to purchase the required mini-jack audio adapter cables and mobile phone and tablet connectors. Whether or not you’ll consider a CEntance MixerFace R4 will depend entirely on your needs and workflows. If, like me, you are looking to improve your audio acquisition capabilities without dragging an equipment handcart around behind you, the MixerFace R4 provides and elegant solution to that conundrum.